Much like Madden's first Tuesday in August, Call of Duty's second Tuesday in November is getting to be a gaming holiday. 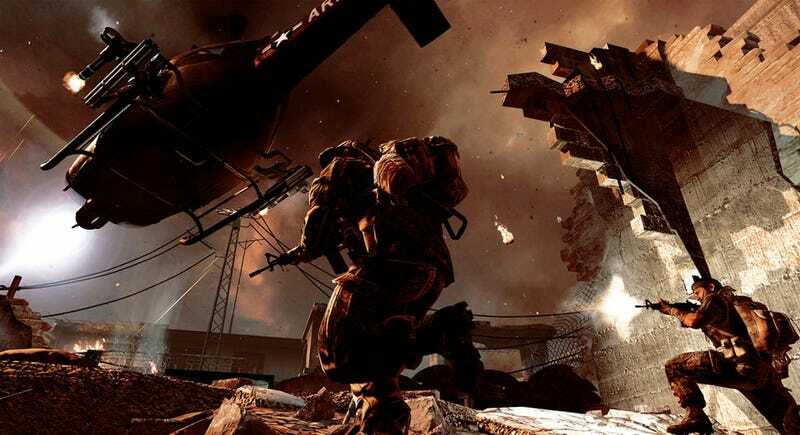 No one's going up against Activision's military shooter, which looks to break records set last year. Call of Duty: Black Ops (DS, PC, PS3, Wii, 360) - Treyarch resumes the story of this military shooter, shifting it to the Cold War and its hotspots in Cuba and Southeast Asia, while zombies return to multiplayer. Also: Beyblade: Metal Fusion (DS, Wii), Challenge Me: Brain Puzzles 2 (DS), Just Dance Kids (Wii), Monster Jam: Path of Destruction (DS, PS3, PSP, Wii, 360), MySims Collection (Wii), Reload: Target Down (Wii), Remington Super Slam Hunting Africa (Wii), Remington Super Slam Hunting North America (Wii), Rune Factory 3: A Fantasy Harvest Moon (DS), SingStar Dance (PS3), The Fight: Lights Out (PS3), The Sly Collection (PS3), Tom Clancy's HAWX 2 (Wii). Nov. 16: Assassin's Creed: Brotherhood; Need for Speed: Hot Pursuit; NBA Jam, Harry Potter and the Deathly Hallows: Part 1. Nov. 21: Donkey Kong Country Returns. Nov. 23: Splatterhouse. Nov. 29: Golden Sun: Dark Dawn. Nov. 30: Epic Mickey. Dec. 7: World of Warcraft: Cataclysm, TRON: Evolution, Bejeweled 3.